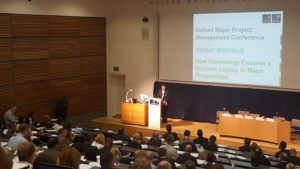 On 11th November 2016 an Oxford Major Programme Management Conference, was held at Saïd Business School, University of Oxford. The theme of the 2016 conference was: ‘Legacy of Major Programmes: Making Good on our Promises’. 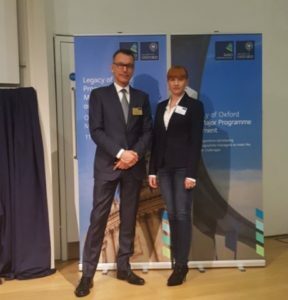 Some of the speaker on the conference were Brendan Bechtel (Chief Executive Officer of Bechtel), Professor Bent Flyvbjerg (BT Chair in Major Programme Management, Oxford Saïd), Rt. Hon. Dame Margaret Hodge (MP, UK Parliament) and Andrew Wolstenholme (OBE, FREng, Chief Executive Officer of Crossrail). Durring the conference a Panel discussion was held with the topic: Women in Leadership – Improving Diversity on Major Programmes. Two important topics were addressed: willingnes to risk and confidence, as important atributes of leader. Most of the participants of the conference were senior project leaders across private and public sector. The expectation of the conference was that participants shared their experience and their expertise with others, so there were some strong discussions about what is left behing enormous infrastructure megaprojects. Now we need to think about future in megaprojects, so we could find actions. Excellent discussion was held on the legacy of megaprojects. There is a need to increase competences on the stakeholder management. Also, cross cultural consideration should be considered. There should be raised open discussion about teams and project managers coming from different cultures. The importance to evaluate megaprojects is even more important because the difference between cost and value is crucial. We are in the critical need of sharing the real data. Stakeholder participation is important element for success of project management on megaprojects. Many megaprojects are addressed without this knowledge (knowledge about competence of people). Moving competent people in megaproject can hopefully move the infrastructure industry forward, although it might seem that it is captured in the past. We need to change society trough successful megaprojects. What legacy do you see beyond infrastructure megaproject?